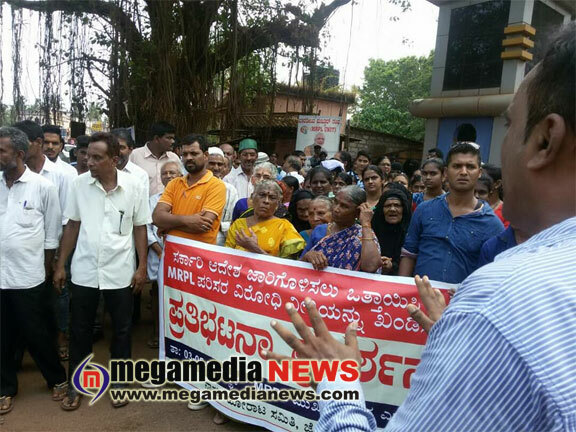 Mangaluru : Nagarika Horata Samithi, Jokatte, staged a protest in front of the entrance to Mangalore Refinery and Petrochemicals Ltd. (MRPL) on Wednesday alleging that the company has failed to implement the steps suggested by the State government to prevent pollution caused by its coke and sulphur units in the Jokatte area. Addressing the gathering, Muneer Katipalla, State president, Democratic Youth Federation of India, said that people in the area have been fighting against pollution since two years. He alleged that the company was not showing interest in taking up the steps suggested by the government. He said that the government had through an order asked the company to create green belt between its units and residential areas and set up an effluent treatment plant. Earlier, the people had dropped agitations following assurances by the company that it was committed to implementing those steps. Now, people have resumed the agitation as the assurances have not become a reality.